I can’t let Left 4 Dead’s tenth anniversary slip by without ringing the big zombie bell. This game means more to me than arguably any other. Valve’s cooperative shooter didn’t just give me a fun time; it’s also responsible for several of my existing friendships, and it kind of got me into this job in the first place. I’ve written about that story before elsewhere, so I don’t want to dwell on it again. Instead, I simply want to talk about why Left 4 Dead is still the best cooperative game ever made. It really is. No other game has made me laugh and curse and joke and argue with my friends quite like Valve’s zombie blaster. In a way it’s odd that nobody has bettered it, because the design seems so simple. There are no classes in Left 4 Dead, no skills to unlock, no specified roles to play. There are only a handful of weapons and levels, and mechanically the game comprises moving and shooting pretty much exclusively. But, of course, the reason Left 4 Dead is so good is because it seems simple. 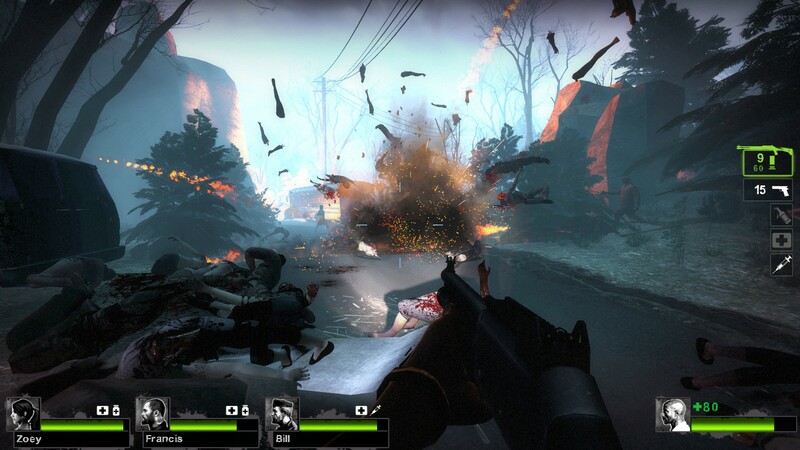 At a surface level, Left 4 Dead is the most accessible cooperative game there is. The very concept embraces this notion. You’re not a crack team of Navy SEALs or god-tier Space Marines; you’re a bunch of scrappy and ill-fitted survivors: a lackadaisical college student, a heavily tattooed biker, a half-crazed Vietnam vet, and a terrified-looking office worker. They’re about as far away from heroes as you can imagine, together purely because they stand a slightly better chance of not having their insides ripped out than if they go it alone. Left 4 Dead’s simple character designs make it abundantly clear that you’re supposed to be inexperienced and you’re supposed to be unprepared. If you can point a gun at a zombie and shoot, that’s a good enough start, because Left 4 Dead is a very efficient instructor. Within five minutes you’ll have figured out that shooting while someone is stood in front of you is a bad idea. By the end of the first level, you’ll have naturally coalesced into something vaguely resembling a team, having quickly come to understand that this game is trying to kill you in any way it can. 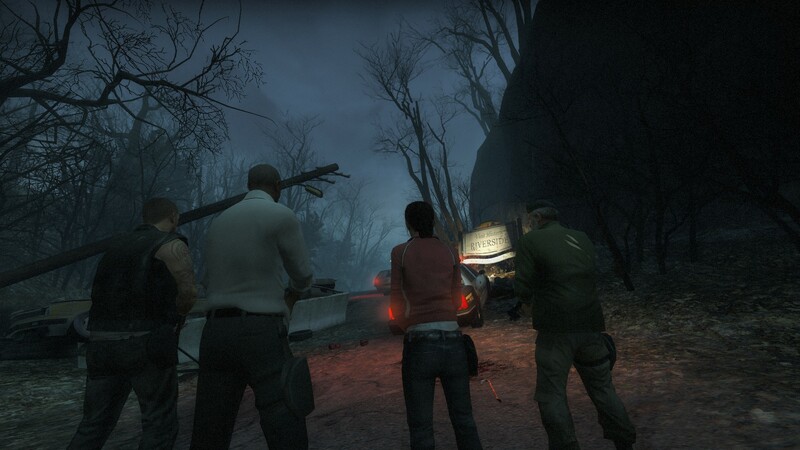 Like a virus infecting a host, Left 4 Dead works all of its despicable magic silently and unseen. Hovering somewhere above you like a malevolent god, the AI Director ensures that while Left 4 Dead’s levels may remain fixed, they never play out in the same way twice. Whether it’s chucking a massive horde of zombies at you or casually dropping a Tank in the worst possible location, the AI Director always ensures the tension is ratcheted as high as it can go. The most terrifying moments are when it clears the area of zombies entirely, letting you travel for a few brief moments unhindered. When it does this, you just know that it’s cooking up something particularly unpleasant. As well as keeping the game fresh and unpredictable, the AI Director ties into what makes Left 4 Dead such a compelling cooperative game, namely that it is constantly trying to stop you from cooperating. 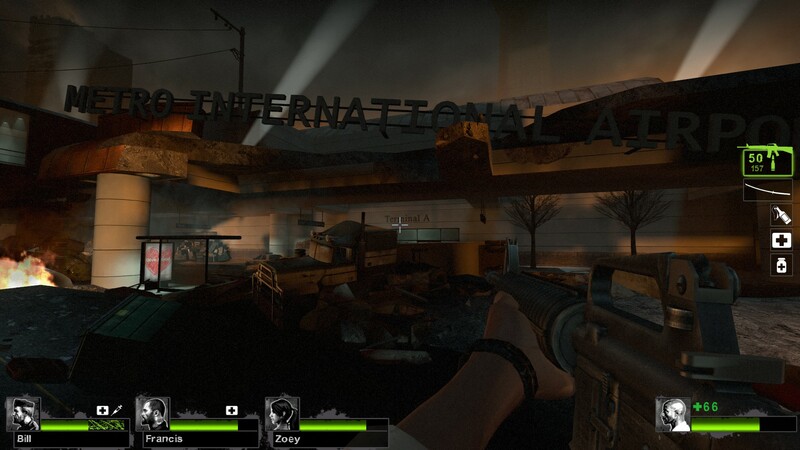 Left 4 Dead has surprisingly few player-to-player interactions. You can hand your teammates a bottle of pills, heal them with your own medkit, and help them on their feet if they get knocked down, but that’s about it. Instead, Left 4 Dead takes a reverse-psychological approach to encouraging teamwork, constantly trying to separate and isolate players, while generally disrupting your carefully laid plans. This is most evident in its Special Infected. The Smoker’s tongue drags players away from the team. The Boomer blinds you and pushes you away from one another with its vast, exploding carcass. The Tank punches players so hard they fly across the room. The Witch places herself at points in the level where there’s often no way past her, often forcing one player to risk their entire health bar to get rid of her. 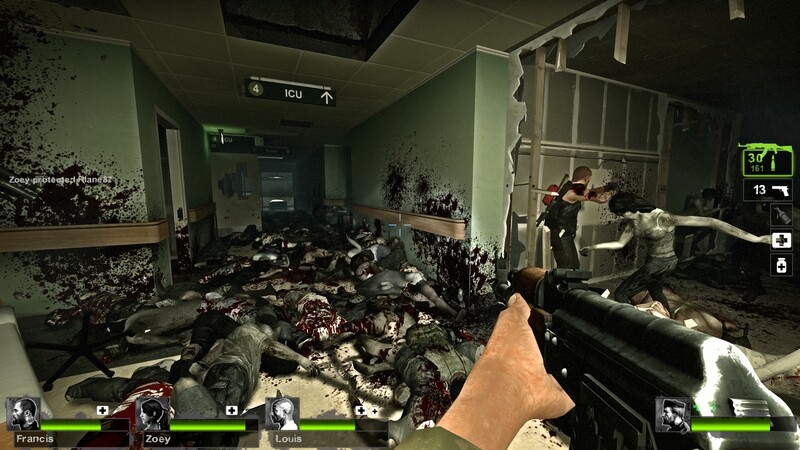 All the while, the game uses its regular Infected to draw players into certain areas, throwing hordes of random sizes at you to throw off your pacing and disguise the attacks of its Special Infected. Through this, the game emphasises the importance of communication, of watching each other's backs, of moving in sync with one another and covering every possible angle. It’s a really clever approach to cooperative game design, and it’s what makes Left 4 Dead special. But it helps that Left 4 Dead is also an astonishingly good shooter, a fact that it rarely gets enough credit for on account of its multiplayer leanings. Indeed, Left 4 Dead is probably Valve’s slickest and sharpest game. Its roster of weapons may be fairly small, but there isn’t a bad one among them. The basic Uzi drills into zombies with its ridiculously high-fire rate, while the hunting rifle has a kick like a concrete mule. My favourite weapon, however, is the Assault Rifle, with its perfect combination of power, fire-rate, and accuracy. When you fire it, it sounds like a passing train, which effectively communicates how devastating it is to anything standing in front of it. The stars of Left 4 Dead’s shooter, however, are the zombies themselves, who are gifted with some of the best animations ever committed to code. The way they react to gunfire, jerking and staggering and flying backward like extras in an old western, is what sells the gunplay better than anything else. Valve clearly understood that players were going to be killing literally thousands of these things as they played, and so each interaction between bullets and Infected had to feel unique and satisfying. Left 4 Dead is an incredible game, which makes it all the weirder that, today, there’s not a whole lot of point in playing it. This is mainly because Left 4 Dead 2 features all of the original's content along with the improvements that the sequel brings (such as a wider array of weapons and Infected, and a better physics and dismemberment system). Even I would recommend playing the second game. 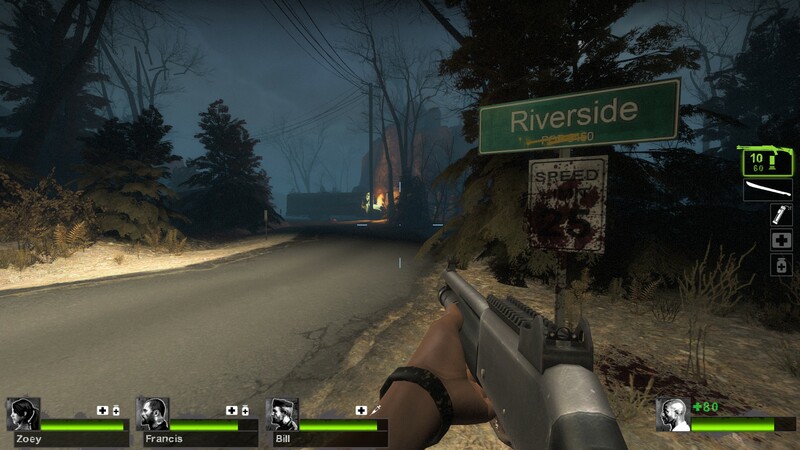 For all intents and purposes, the original Left 4 Dead is an abandoned game, one that only really had relevance for about a year before the sequel came along. Yet despite that, it’s probably still the most significant game in my entire Steam library in terms of how it has influenced me. I know Half Life 3 is the game everybody wants from Valve. But honestly, a Left 4 Dead 3 would probably receive far more of my attention. Last time it was zombies. Now it's zombies from the deep south? Did the apocalypse just get a whole lot worse or a hell of a lot better? The only way to find out is to grab your chainsaw and head deeper into our review of Left 4 Dead 2 to see what we think. Valve has published the public stats for Left4Dead, revealing that nobody has yet claimed the Zombie Genocide acheivement.